Drawing inspiration and resources from Professor Liao Yin's work, Chinese Special Acupuncture Therapy, Wong incorporated tongue acupuncture into his clinical practice, in particular for cases of neurological and cardiovascular disorders, with remarkable therapeutic effectiveness. A Hong Kong colleague, Professor Sun Jie Guang, has discovered over 40 acupuncture points on the tongue, each corresponding to different areas inthe brain and to various organs and body parts. 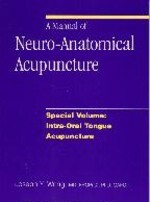 Wong presents this unique microsystem with his characteristic emphasis on anatomy and physiology, giving at last a chapter to tongue acupuncture points and one to therapeutic treatment strategies.